I love your cat, your house, your writing, and thanks for making me laugh. I’m so glad you liked all of it, especially that you laughed. Thanks for the visit and comments. Much appreciated. As this blog says, one project per weekend. Sometimes it’s nothing big, maybe just some planning. We keep a list of seven in advance. Mark them off as they are completed and add another to the bottom to make seven again. Sometimes its even making appointments for check-ups with the doctor, financial planner, or sitting down to plan a trip. During the week, in addition to the regular routines I try to do one mundane task per day. That usually involves culling the paper pile, tossing and filing. Yuk! It’s my most begrudged task of all! With your neighbors little farm nearby, you get to enjoy the animals with none of the care! If I could I’d like to add a couple cows. Hubby draws the line with two cats, one dog. Thanks for your comments. I’m really liking your blog, by the way. You are right that it’s nice to have the farm and get to enjoy it without doing the work. I’ll try to help her and she’s a lot younger than me and won’t let me. Any time I’m upset I can go up there and sit on the porch and the animals will come and love my problems away. They fight over who is going to get to sit in my lap and give me kisses. It’s nice, very healing. Keep writing. At the very least, it is a legacy accessible to your family for all time. And it is for you. If you want more readers follow WordPress’ own recommendations. Subscribe to their Daily Post for great ideas, updates and more. Also, at the bottom of your stats page are all kinds of idea posts within WordPress to help you. Above all, have fun. The day it becomes a burden is the day to think about quitting. But find something else to enjoy. I felt very empowered when I bought my own power drill. (No pun intended. Hee.) And you should have seen me the first time I used a circular saw without cutting off (or into) a body part. I was very proud of myself. I also think your cat is beautiful. She looks very much like our cat, Jazzie, who passed away last year. Hahaha! A circular saw? Oh, I am so impressed! I don’t think I could ever raise to the heights of that! Incredible! 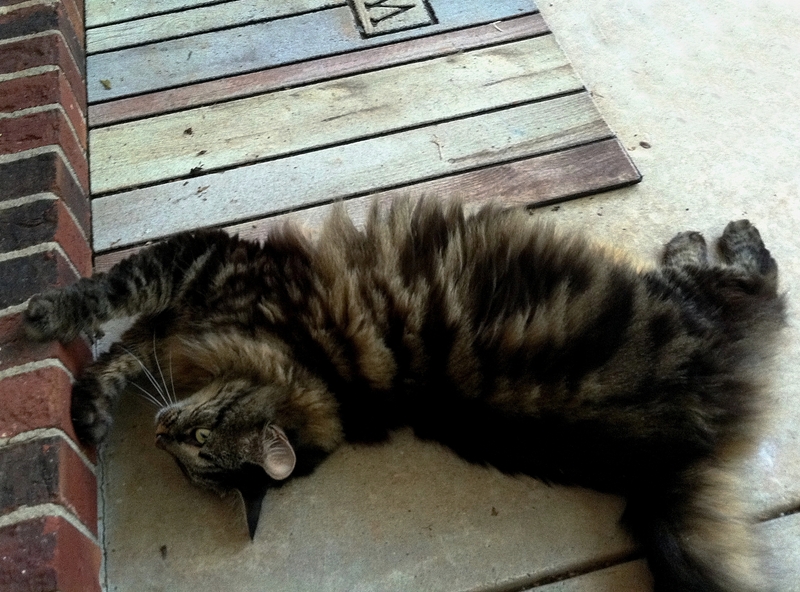 This feline is the front-porch cat. The other is the back-porch. Never do they meet. They can’t stand each other but love the dog. Go figure! This cat is the sweetest, cuddly thing. 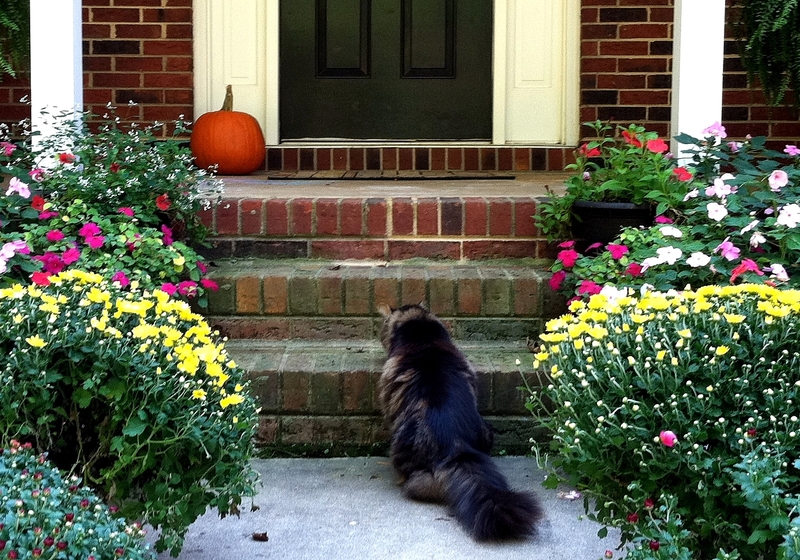 Fierce as a lion, though—depositing her conquests at the front door. Ugh! Another dreaded task of mine to go with your onerous chore post! This is a great post! Glad you were able to conquer your procrastination and have a new skill! Thank you! I conquered it that weekend anyway. Got only one thing done this past week but it was a pretty big one. Life seems to be filled with constant projects. Will it ever stop? Hahaha! I get it and oh how I do agree! I promise to NOT complain. Loved this post! Learned how to use a large power sander this way. Sanded an entire room, needless to say, could not move my arms the next day. You and your husband sound so much like me and mine. I am always saying, “honeyeee” as you put it. Loved it, great post and written in the active voice very well. congrats to you and your philosophical cat! “The cure for procrastination is one small step.” I’ve never thought about procrastination in that way. But even one small step takes a lot of effort to make, and I’m lazy I’ll try it though the next time I have an urge to procrastinate.